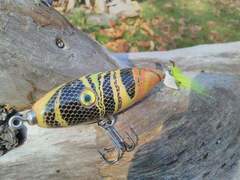 This was my first carved lure which I made from a scrap piece of persimmon. I would like to make another from balsa wood and add a deep diving lip. This one was just for fun but I think its worth another try.